The California coast redwoods at Armstrong Redwoods in Sonoma County are the world's tallest living things. 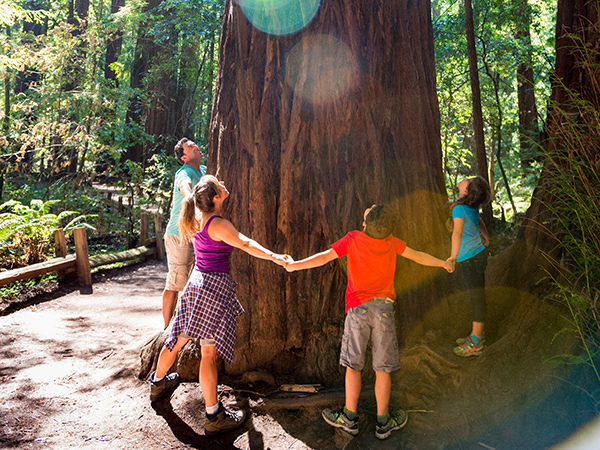 Armstrong Redwoods is a great stop with the whole family when in Sonoma County. It’s impossible to visit Sonoma County’s Armstrong Redwoods State Natural Reserve and not be transformed, however briefly, by the magnificence of nature. Beneath this redwood forest’s magnificent, soaring canopy you’ll feel silenced by the trees’ majesty and humbled by their endurance. And there’s simply something about being surrounded by trees that have lived more than a thousand years that slows you down and causes you to reflect. When you leave a redwood forest, the world is never quite the same, at least for a little while. California’s coast redwoods (Sequoia sempervirens) are the world’s tallest living things (the largest measured to date was 379.3 feet high). Not only that, but they’re also among the planet’s oldest living things, capable of surviving for 2,000 years or longer (their average life span is roughly 500-700 years). Before the mid-19th century, coastal California was thick with redwood trees from the Oregon border south to Big Sur country. But the discovery of gold in 1849 brought a massive influx of people into the state. Redwood trees—with their beautiful, sturdy, fire-resistant wood—quickly came under the lumberjack’s ax. Eventually more than 95 percent of the state’s old-growth redwood forest disappeared. Lucky for us, enlightened Californians began working early on to preserve the groves and forests that remained. The result is that, today, the trees are protected in a variety of national, state and other parks accessible to the public. 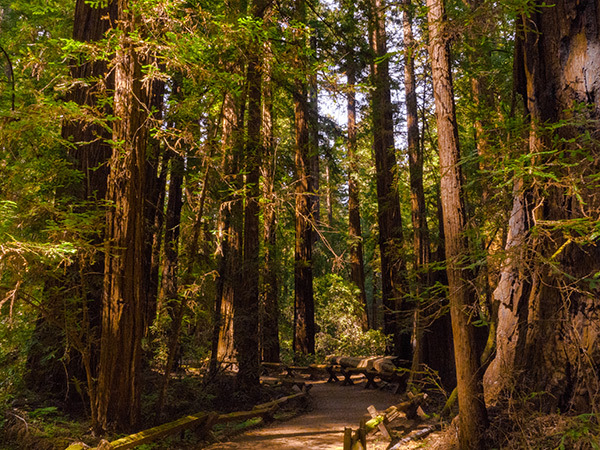 Located just north of the Russian River in a canyon two miles from Guerneville’s Main Street, Armstrong Redwoods was set aside as a natural park and botanical garden in the 1870s by Colonel James Armstrong—a lumberman, ironically enough. His daughter carried on his preservationist work after his death, and was instrumental in getting the public involved in saving what remained of the area’s redwood forests. The grove was purchased by the County of Sonoma in 1917, which managed it until the State of California took it over in 1934. The oldest tree, Colonel Armstrong, is more than 1,400 years old. The tallest tree, Parson Jones, extends upward more than 310 feet (it’s taller than a football field is long). The most burl-heavy tree, Icicle, shows an unusually large number of the burl formations that can grow on redwood trees (burls can weigh tons). 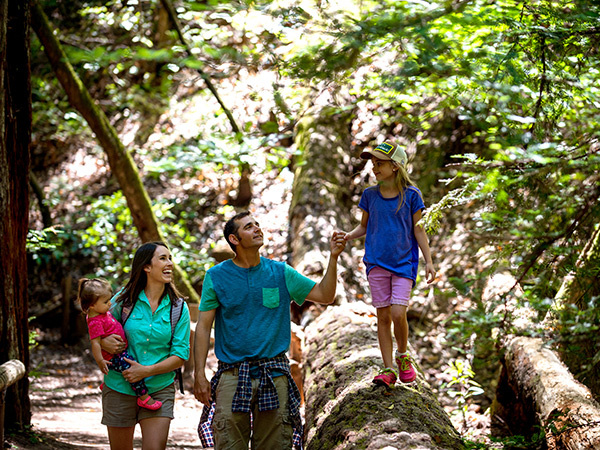 The self-guided Armstrong Nature Trail is the best bet for first-time visitors, since you’ll learn about redwood trees via interpretive displays as you stroll along. The Discovery Trail offers an unusual feature you’ll probably want to try: a tree-hugging platform. Both the Discovery Trail and the Armstrong Nature Trail are wheelchair accessible (and the former has interpretive panels in Braille). Armstrong’s trails are relatively short, but you can string them together and loop around to create a varied five- to six-mile hike. If you want more of a workout, take a trail leading into adjacent Austin Creek State Recreation Area, which has 20 miles of trails. The store contains exhibits about the Reserve’s natural and cultural history, offers changing programs, and is staffed with knowledgeable docents who can answer your questions. Publications, clothing, and other items are for sale. Proceeds help support the park. Open 11 a.m.-3 p.m. Enjoy your food and the tall trees at your own pace. Picnic tables, grills, and restrooms make it easy. Built in the 1930s, this 1,200-seat amphitheater is occasionally utilized for concerts and plays. It’s completely surrounded by soaring redwoods and has the feel of an ancient cathedral. Go horseback riding on the East Ridge Trail or Pool Ridge Trail, depending on seasonal conditions (which sometimes necessitate closing the trails). Dogs are not allowed on the reserve's trails. Admission is $8 per vehicle, and free to pedestrians and cyclists. (It's possible to park outside the reserve's entrance gate, and walk in without paying the vehicle entry fee.) For more details, download a brochure or visit the park’s website. View a map showing all of California’s coastal redwood state parks. To learn about Public Education Programs, visit Stewards of the Coast and Redwoods.